Designing and Building Sets on a Budget. When you attend a big musical, opera or major play the set can make you swoon. But how can you be just as effective on a tight budget? 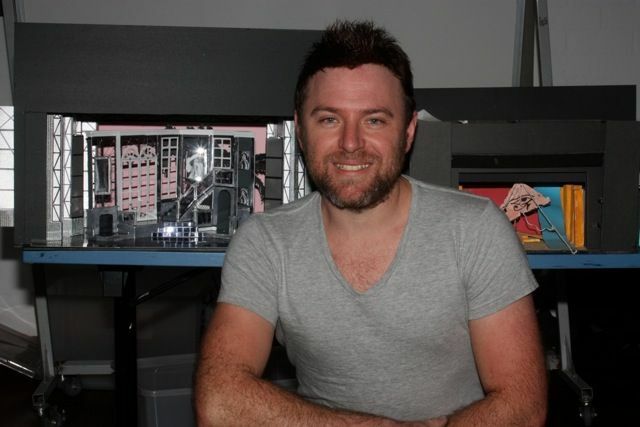 Sydney set builder and designer Simon Greer has some of the answers. When I started at NIDA our lecturer asked us a critical question at our first lesson. What is the most important thing about a set? We came up with lots of answers. Location, size of stage, mood, budget, how many scenes, and how many fly lines, were some of them. The correct answer is … what is the story about? Everything flows from that. Every decision has to come back to what’s the play or musical about. 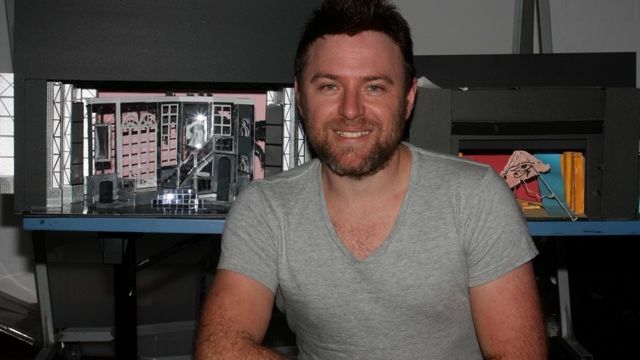 The set designer works closely with the Director to support this vision. The tradition in the 18thand 19thcenturies was for lots of scenery. There were drops everywhere that were painted beautifully. There was scenery for scenery’s sake. There was a lot of spectacle and people could see where their money went. Then in the 20th century there was a movement in some quarters to more minimalist sets. To get rid of all that excessive material to make sure what is on stage really contributes to what the play is about. You may do a play which is set in a living room. You might think, we’ve got to have a wall there, window here, furniture, TV, couch etc. But if you analyse what the play is about, you might find this is about family relationships breaking down. That is what the story is about. So to symbolise this, instead of building a beautiful house with flats and doors you may just need two actors separated by a crack on the floor. If it is set in the 1950s and all you can afford is one chair, then make sure it is spot on for the period. Don’t just get one from the rehearsal room. Get something fantastic. You might turn it over so it doubles as a table that they can eat off. If you have a small budget everything on stage has to enhance the story. Likewise if it is set in London you may not need the whole backdrop of London – maybe just a tube sign is all that is needed, or a London phone box, to tell the audience where you are. Of course it is not possible with every production. If you are staging Noises Off for instance then you need a two story set with ten doors and windows that open and close – all set on a revolve. But for many other productions a minimalist set is possible. Building and designing a set is a collaborative project involving the costume and lighting designers, and, of course, the director. Some directors have a very strong idea of what they want. They might say I see a chair here or a window there. With a director with very strong ideas, take that on board as long as it tells the story but put your foot forward to arrive at a happy medium. I still build models. People ask me whether models will be overtaken by computers. But models will always be good because you can play with them like a dolls house. You can sit there and slide things down or turn it upside down. You can’t play with a 3D computer program. Most models I use are at a ratio of 1:50 – which means they are exactly one 50th the size of the set. In professional theatre the industry standard is 1:25. Also be wary that in professional theatre the painters may exactly copy the model box. I helped paint a show for the Sydney Theatre Company. The show had backdrop scenery. The designer came in to approve it. He walked over and asked, ‘What is this brown spot here? The painter said, ‘It’s on your model.’ As it happened he had spilled coffee on his little set model and they painted it exactly - incorporating the coffee drop into actual set. At the other end of the spectrum I have built sets on minimal budgets. I built a set for a modern production of Snow White for Macquarie University. The budget was $300. It was made from mesh with coloured objects in it to symbolise trees. It had a little house to signify the dwarf’s home. It had a mirror which was just a curtain which was pulled back when the mirror spoke to the Queen. The large size of the mirror also helped tell the story. For a school I built a set for Seussical for $2000. I had to fit 80 kids on stage and every grandma needed to see their child. So I made the set very wide and deep. This was the most expensive component – a rostrum that I rented for $1500. The scenery bits were made from cardboard and electrical conduit to resemble a Truffula tree. There are tricks you can do to save on cost. For a production of the Glass Menagerie by Tennessee WilliamsI had to build the set inside a very small theatre and had to give the impression of looking down the street. So I lifted the whole house up a bit on a tilt and set it in a blue brick box. This was to suit the story of an isolated little family that had trouble dealing with the rest of the world. It was almost like a floating house. It was to convey that something was not very nice and not quite right in the world. I built it from an old fence so it had a weathered, slightly deteriorating look. For a production of The Little Mermaid I had a tin curtain which lifted when the scenes went underwater. For a production of Aida I had a yellow floor and four columns on wheels. By turning the columns it created a different world. On the reverse were glass cabinets displaying objects at a museum. I used blue material to signify the Nile. Sometimes Simon gets some real money to spend. His budget for the Willoughby Theatre Company NSW Premiere production of Sunset Boulevard in November this year is $10,000. Sunset Boulevardis about a fading silent movie star, so it is built inside a big tin structure resembling Paramount Studio 18. Everything in the show fits into that. The famous Hollywood sign will glow for the whole night. There is no flat wall at the back. The presence of Hollywood is almost always there. It will take three weekends to build it. Everything is made from standard size stock flats, re-used from other productions. I never just build for the current show but am thinking how can I use it again. Sunset Boulevard plays from November 16 to 24, 2012, at the Concourse, Chatswood.